Tag: Peoria Carp Hunters | FISHING FURY - A Fishing Blog with Attitude! 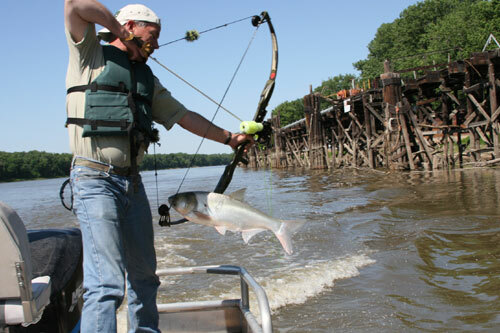 The Peoria Carp Hunters are back with yet another asian carp carnage video. It’s videos like these that have me seriously considering buying a bow this year, honing my skills, and possibly even checking out some of the local bowfishing opportunities. I’m also hoping to take a trip to the Chicago later this year and time permitting I’d love to take the trip down to Peoria to do some epic aerial bowfishing of with these guys. The Peoria Carp Hunters were also featured on Animal Planet’s “OFF THE HOOK” with host/pro wrestler Eric Young. Check out the video after the break. There are many ways that the USA is dealing with the Asian Carp invasion, there’s the electric fences (that may have already failed), a campaign to get people to eat them by calling them “Kentuky Tuna“, even extreme aerial bow fishing groups, but none of these ideas are as awesome as this one from the Peoria Carp Hunters! Trailer is up first, full length cuts after the break!